The year is 2880. During the Nuclear World War the Robotnik family became saviors of the animal kingdom, rounding up any critters they could find and encapsulating them in robotic shells to protect them from the harsh, toxic rays permeating the world. These robots could defend against any mutated attackers that weren’t lucky enough to be found by the Robotniks. One such mutation is the hedgehog known throughout the slowly recovering wasteland as SONIC. 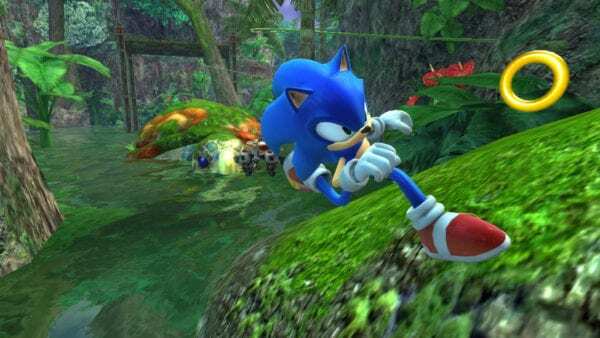 A far cry from his species of days gone by, SONIC is approximately four times the size of a normal fully-grown hedgehog, and sports a vivid blue hue unlike anything scientists had seen before. Most interesting of all is SONIC’s ability to run at supersonic speeds, earning him his nickname. Sonic the Hedgehog shakes up the side-scrolling platformer formula by putting the player in the role of the bitter antagonist SONIC, who is hell-bent on releasing the world’s animals back into the wild to become mutated deformities like he is, and make Dr. Robotnik suffer for not saving him like he had so many others. It’s Saturday night and you’re wandering the streets of Russia, checking the local clubs for just the right scene. You’re a tall, lanky fellow, looking for action in all the wrong places. You turn a corner and finally happen upon just the kind of dive you were looking for. This place is blaring electronic music, strobe lights are flashing, and everyone is on the dance floor grinding all over each other. The jumbled crowd looks mildly intimidating, with a wide variety of body shapes all over the place. Some are short and stocky, looking quite square-shaped. Others are on their hands and knees, giving the vague appearance of the letter Z. You are easily the tallest person there. Nervously searching for a place you might fit in, you suddenly spot an opening seemingly made just for you. As you take your place on the dance floor the whole ambiance changes. You were the missing piece to the puzzle, and everyone starts dancing faster and closer as the music speeds up. The song ends, everyone collapses, and the floor is cleared away for the next group to enjoy. Exhausted and content, you gaze at the establishment’s neon sign and you tell yourself that you will most definitely be returning to TETRIS in the future. Vegans don’t eat meat. In fact, Peope for the Ethical Treatment of Animals, or PETA, has long tried to enter the world of video games and show gamers that using and abusing animals is cruel and wrong. The group recently introduced a parody of Mario’s Tanooki Suit power-up in a fairly disturbing manner, but perhaps their best attempt at swaying the gaming populace was with the arcade smash hit, Pac-Man. The ‘easy to learn, impossible to master’ game features a yellow creature (it is uncertain whether this creature is supposed to be human or animal – the creators have always been intentionally vague when the question arises in interviews) that eats everything in sight, taking care to include no meat in its diet. Pac-Man happily chows down on assorted fruits such as cherries, strawberries, and oranges; pellets – multi-vitamins to provide your body with its necessary nutrients; and ghosts – because of course you cannot eat human flesh, being meat, so you must remove the corporeal body in order to devour the soul left behind. When you think about it, the truth has been staring us in the face the entire time. Take another look at the PAC-MAN logo above. Drop the P. Flip the A upside-down. Swap the C and M, and rotate the M 90 degrees clockwise. What are you left with? You want aliens? Maybe a little time travel? Some portals and super sentient marine life saving the universe from destruction? That all sounds cool. But you won’t find any here. Ecco the Dolphin is a dolphin simulator. You swim around the ocean, race against your dolphin friends, and enjoy the scenic underwater views with your dolphin girlfriend. That’s literally it, and it is amazing. Tetris isn’t quite what you thought it was.